The second young male left the nest area around 8 AM on Friday (6/2) and disappeared for over 24 hours. Volunteers searched high and low without spotting him. We know from watching these young falcons over several seasons, that they can disappear on the first flight and reappear a few days later. Sometimes they are on a roof where we can’t spot them, although their parents are aware of their whereabouts. However, nothing could have prepared me for how he made an appearance late Saturday morning. I often use the hatchback of my car as a portable birding perch and sit in the back with the hatch door open. 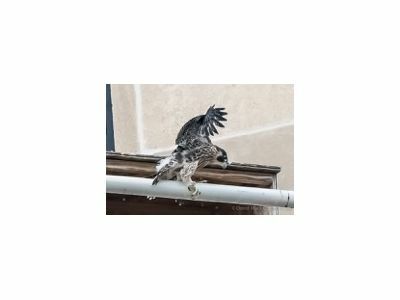 I had settled in for a good sit to watch the female chick at the nest when up on the roof, there arose such a clatter – of falcon talons and wings. I looked up to see our missing fledgling peering down at me from the open hatch. I have observed a lot of goofy behavior from these teenage falcons who often seem unconcerned about their proximity to humans and don’t always seem to exercise the best judgement, but landing on my open hatch door a foot from me was a surprise. After scratching up the paint a bit, he hopped over to the ledge of the parking deck and walked around for a while then flew to an adjacent building, where he didn’t quite get the elevation he needed. He spent the rest of the day and night on a 4-inch window ledge before taking a few flights the following day. He has managed to stay airborne so far, although his skills have a way to go before he can predictably land at his intended perch. The young female chick is still at the nest site. Falcon chicks typically fledge at 40 – 45 days and she is now 40 days old, which hopefully will put her in good condition for her first flight. Interested volunteers are welcome to watch from the top of the parking ramp to witness her flight and track where she goes.